This touching photograph of the groom reunited with his grandfather through photography is my favourite of all the shots I took during this wedding at The Carlu. 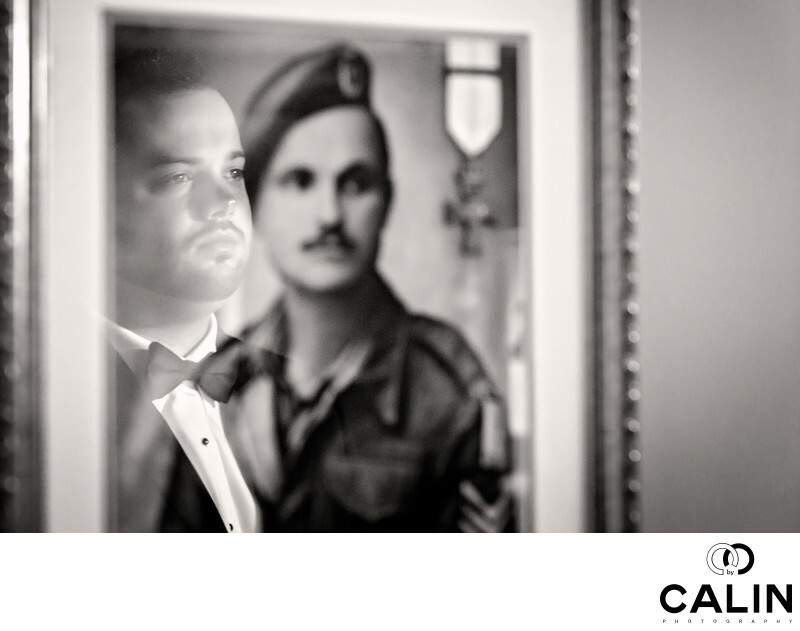 During the groom's preparation for his Carlu wedding, I noticed a portrait of the groom's grandfather on the wall. I immediately saw an opportunity for a great photo. First, I took a few test shots to make sure I can create a striking image. After that, I positioned the groom in such way so I could capture his reflection in his grandfather's photo. I even posed his eyes so that both subjects look towards the same spot in unison. The result? The groom and his grandpa look alike in this family heirloom. Here are the techniques I used in creating such a complex wedding photograph. I shot this image at F5.6 to make sure that both the groom and the gentlemen in the original picture were in focus. Next, I asked my second shooter to illuminate the groom's face with a video light. In complex situations like this one, using a continuous light helps tremendously because one can see the result before taking the shot. Often, focusing on the subject's eyes in the reflection is difficult because the lens is confused and alternates focus between the real subject and the picture. I captured a few frames and this is the winner. As the original photo dating from the second world war was black and white, I applied a similar processing to match the look of the original image. Location: 444 Yonge St., 7th Floor, Toronto, ON M5B 2H4.